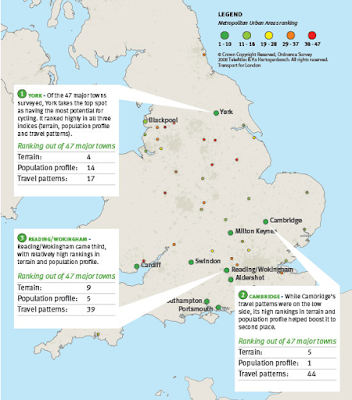 A new tool to help identify where the best places are to invest in cycling has been launched by consultant Steer Davies Gleave. 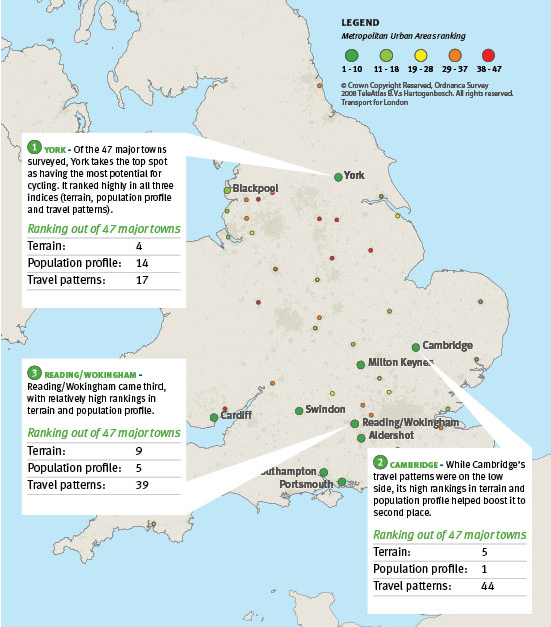 The cycling potential index aims to provide an objective measurement of cycling potential by scoring three attributes of an area: its hilliness, socio-demographics, and length of journey to work trips. The index can provide results at different levels of spatial detail, such as an entire urban area or a neighbourhood. You can download the paper for more information on how the index was calculated, along with the full rankings of the 47 towns and cities that were surveyed. New research commissioned by Cycling England has revealed that two thirds (64%) of women say they never cycle and just 2% cycle every day. Men are still three times more likely to cycle than women. Today’s poll suggests that the perceived effect of cycling on appearance, together with a lack of confidence in cycling on the road, is behind this gender imbalance. * 19% wouldn’t want colleagues to see them without make-up or stepping out of the office shower. What the research fails to consider, however, is just how ethno-centric such perceptions are. When attitudes are compared to those amongst women in cycling-friendly cultures, concerns about helmets, showers and sweating miraculously disappear – because they are simply not needed. The study contrasts with a film and photography project currently underway in Darlington and in Bremen, Germany, which explores the attitude of teenage girls to cycling in both communities. Cycling is highly popular – and seen as fashionable – in cycle-friendly Bremen. Most girls in Darlington lose interest in cycling by the time they are 15 years old. Attitudes and infrastructure appear to be strongly connected – good, safe cycling infrastructure that offers car-free routes most of the time means that cyclists can travel at their own pace, and not have to battle with motorised traffic. Attitudes to cycling change as a result. When teenagers in Bremen were asked how they deal with rain, they replied “we use an umbrella, of course“. There’s a really useful post on the forum of Moving Target ‘zine explaining the blind spots around a HGV, written by a truck driver. The images take a bit of understanding, but reading the explanation makes it much clearer. Read it. It might save your life. * About five minutes in, pedestrianised shopping area – with bikes! * Do it a bit at a time; never have a big plan to switch from cars to people, because you’ll lose the election – people will think it’s impossible, but it isn’t.